Ndu Ughamadu- Abuja: Encomiums and wide-acclaim came the way of the Nigerian National Petroleum Corporation (NNPC) on Tuesday as the curtains fell on the 16th edition of the NNPC National Science Quiz Competition with Enugu State representative, Master Okeke Tony Kabilan, carting away the coveted prize. The grand finale of the quiz competition, which is the Corporation’s most significant Corporate Social Responsibility (CSR) initiative, was graced by two former Heads of State, Gen. Yakubu Gowon (Retd.) and Gen. Abdulsalami Abubakar (Retd. ), who applauded the Corporation for foetering educational development and national unity through the competition. After a round-robin question and answer session featuring 18 participating state finalists drawn from each of the six geo-political zones, the Enugu State champion finished tops with 75 points while Ogun State representative, Master Igban Emmanuel, clinched the second position by whiskers with 65 points after winning a pulsating tie break with Master Alikah Joseph Ehiagwina of Edo State. Gen. Gowon, who was chairman of the occasion, commended the Corporation for organizing a shining example of CSR initiative which, according to him, had witnessed massive innovations and improvement through the years. The former Head of State applauded the Corporation for increasing the scholarship sum from N100, 000 to N300, 000, stressing that the move was a soothing balm for the winners in the face of rising cost of quality education. He also thanked the management of NNPC for the introduction of N100,000 educational grant to all winners at the state level. Special Guest of Honour, Gen. Abubakar, in his remarks commended the Corporation for its unflinching commitment to the growth and sustenance of qualitative indigenous manpower across all tiers of the hydrocarbon value chain. 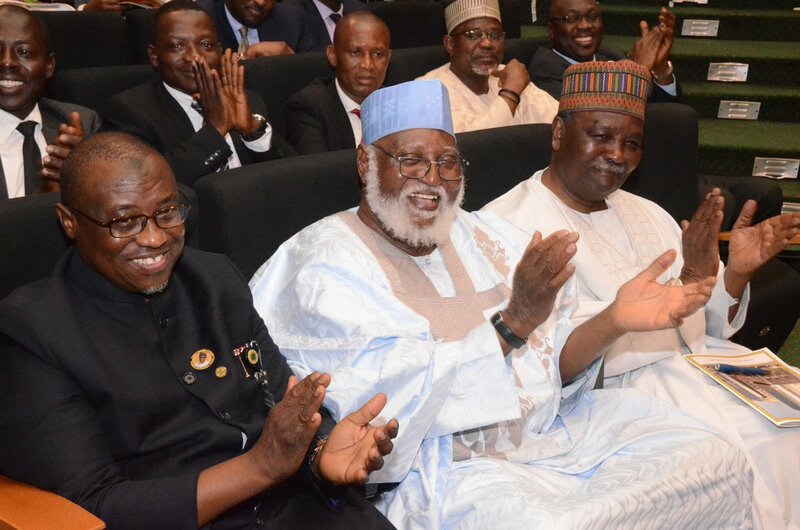 Gen. Abubakar said NNPC’s record in championing the Nigerian content initiative in the oil and gas industry was a noble and patriotic step, noting that the essential philosophy behind the National Science Quiz Competition was to ensure that the production line of highly skilled labour remained intact and prolific. Minister of State for Petroleum Resources, Dr. Ibe Kachikwu, in his address expressed satisfaction with the NNPC Management for sustaining the annual national science quiz contest and urged the NNPC to consider extending same gesture to students in the arts and social sciences. Chief host of the event and Group Managing Director of the NNPC, Dr. Maikanti Baru, said NNPC Management would continue to build on the landmark achievements of the competition in the years ahead. Dr. Baru pledged that the Corporation would ensure the test administration met international standards given the existing collaboration already established with the West African Examinations Council (WAEC), the Junior Engineering Technical Society (JETS) as well as the Science Teachers’ Association of Nigeria (STAN), which were rubbing off positively on the status of the initiative. He noted that quiz competition has proved to be a huge success with many of the past winners doing very well in their chosen careers across three continents of the globe. “From the survey we carried out, we discovered that over 90% of our past quiz winners are doctors and engineers. We traveled to about three continents of the world to locate what we describe as NNPC Science Quiz Competition Laureates in their various fields of endeavor. Some are at Harvard and other Ivy League Universities as research fellows”, Dr. Baru stated. The NNPC Quiz Competition was inaugurated in 2000 and limited to participants from the Niger Delta but went national in 2001. Designed mainly for students in the nation’s secondary schools, the competition has impacted positively on the intellectual attainment of young Nigerians. It has provided financial succour to successful contestants who have been placed on scholarship throughout their university education. Many of the awardees had moved on to achieve academic laurels in tertiary institutions, locally and internationally. The competition was set up to promote science education in the country; encourage students in the study of Science and Technology related subjects; prepare students for promotional and qualifying examinations; build friendship amongst the participating students; and develop students’ competitive spirit, among others. The event was attended by the Governor Godwin Obaseki of Edo State, Governor Atiku Bagudu of Kebbi, Governor Darius Ishiaku of Taraba State and a host of other dignitaries from across the country.